Dry Eye Solutions | Paragon BioTeck, Inc. Welcome to Paragon BioTeck, Inc. Our commitment to sustaining an unparalleled standard of knowledge and proficiency within eye care drives our mission to create and bring to market pharmaceuticals and medical devices that enhance your quality of life. Our product portfolio consists of prescription (Rx), medical device and cosmetic solutions for the diagnosis, management and treatment of ocular conditions including dry eye disease and eyelid hygiene. 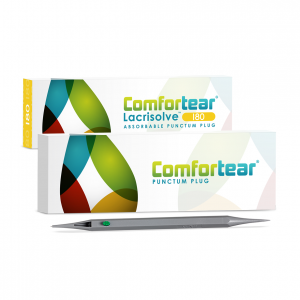 The Comfortear® Punctal Occlusion product line provides both long-term (Comfortear® Punctum Plugs) and absorbable (Lacrisolve® 180 Absorbable Punctum Plugs) options providing occlusion therapy for the treatment of dry eye disease. 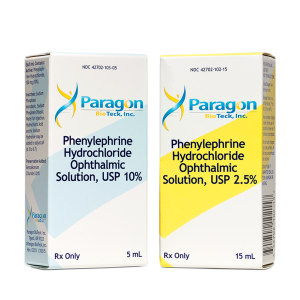 Phenylephrine Hydrochloride Ophthalmic Solution, USP 2.5% and 10% is an alpha-1 adrenergic receptor agonist indicated to dilate the pupil.